Uncertainty, complexity, and regulatory oversight are increasing in todays market. To help ensure sustainable growth and performance, chemicals companies must constantly innovate and adapt their products, processes, and business models. Product innovation and integrity: Streamline new product development processes with integrated data models. 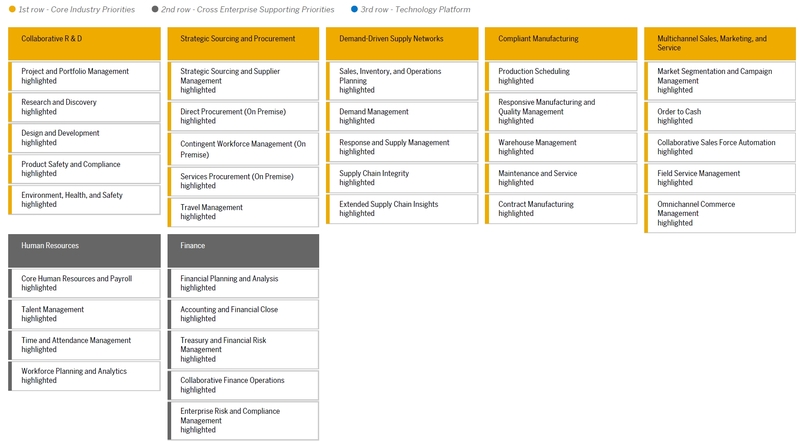 Manufacturing: Synchronize manufacturing processes and deliver real-time operational insights. 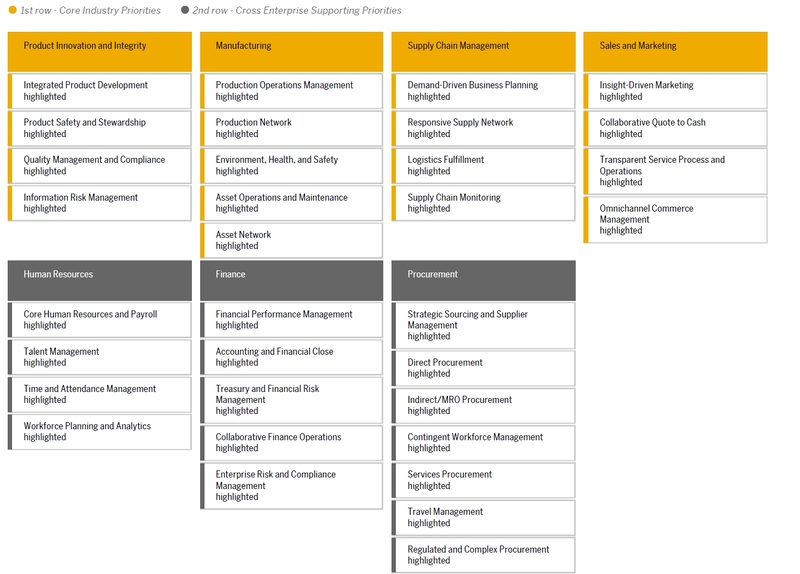 Supply chain management: Enable real-time supply chain planning with a unified model of demand, supply, and financials. Sales and marketing: Increase visibility into sales performance and pipeline across all channels. Better process control and integration enabling real-time insight into customer demand and overall performance, and better management of product, operational, and financial risk secures sustainable revenue streams and brand recognition. Safely optimizing asset performance, meet demand at maximum profitability, and increase returns on product innovation. Manage pipeline, prices, and margins along all sales channels. Sync manufacturing execution with planning, scheduling, maintenance, risk, and quality management. Sync supply with demand while proactively managing risks of supply chain disruption. Life sciences companies are in a complex market where healthcare costs have risen rapidly while reimbursements and margins have fallen to new lows. New genomic and large-molecule innovations are transforming therapies and improving patient outcomes. Targeted treatments for individuals with similar genetic markers continue to advance quickly. New collaboration models across partners, providers, and patients reinforce this trend. Collaborative R&D: Streamline development, analyze Big Data to develop personalized medicine, and manage global collaboration and R&D costs. Strategic sourcing and procurement: Simplify sourcing and procurement processes, including management of third parties, with full visibility into spend and supplier performance. Demand-driven supply networks: Synchronize global demand and supply, optimize inventory, and help ensure global traceability of goods for patient safety. Compliant manufacturing: Integrate core manufacturing processes internally and externally to achieve real-time visibility and mitigate risks. Multichannel sales, marketing, and service: Improve ROI and customer satisfaction by consistently demonstrating product and service differentiators across the spectrum of patients and caregivers. Mining companies need to address the key industry challenges of commodity price volatility, operational productivity, and environment and safety. This requires a robust foundation of integrated IT and operations technology. Optimized mine operations: Integrate and increase visibility into mining assets and operations. 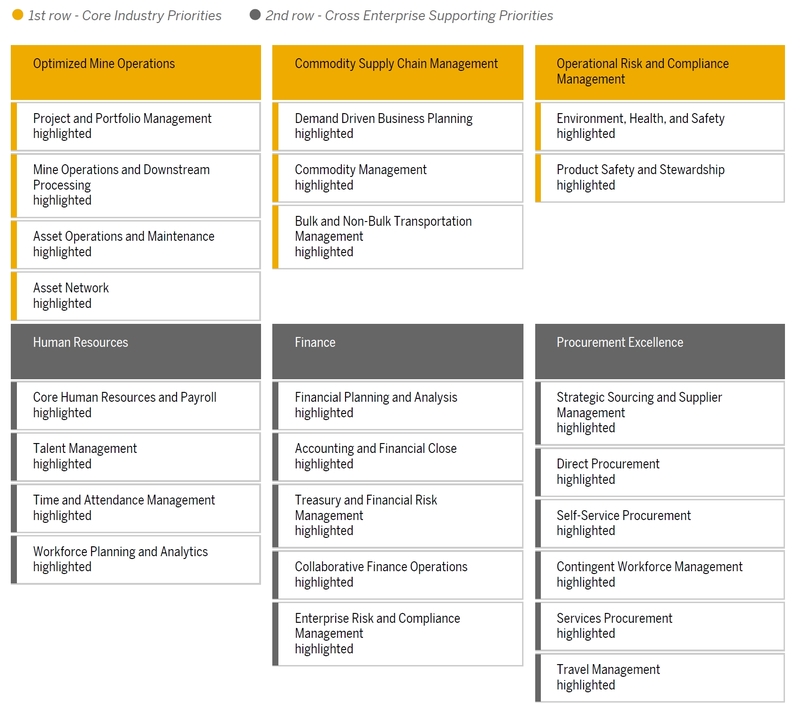 Commodity supply chain management: Streamline, automate, and increase visibility into sales and transportation. Operational risk and compliance management: Assess and manage operational risks, environmental performance, and compliance. Integrate your applications landscape for seamless information flow. Align production and maintenance processes.